Is the river too cold to take a bath? Here is our proposal : an outdoor bathtub with firewood and cooking space. and after 2-3 hours, the water temperature rises to 45 degrees. 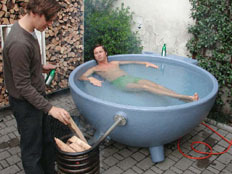 Now it is ready to enjoy a relaxing outdoor-bath. The Tub takes four persons. According to the outside temperature, water reaches 37 degrees Celsius after about 180 minutes. 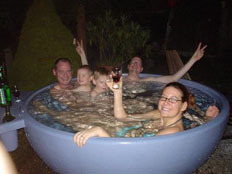 The Tub weights 75 kg without water, and can therefore easily be carried by two persons. It must be placed on a even and hard ground. Filled with water, it wights 700 kg. The delivery and removal is made by our company. The cost for delivery and removal is CHF 1.- per kilometer starting in 2500 Biel-Bienne. The Tub must be cleaned before returning. At temperatures below 2 degrees Celsius, there is a danger of frost in the heating coil. Therefore the heating must be maintained at all times or the water in the tub and the heating coil emptied.